LEO IMAMURA TALKS ABOUT MOY YAT. In a exclusive for KIAI MAGAZINE, Master Leo Imamura spoke about the beginning of his carrer in martial arts, also about his first meeting with Ving Tsun and Grand-Master Moy Yat,about his plans for future as well. Master Imamura said that started with japanese martial arts, like Judo, Karate and Kobudo, but he realized that his identification was with Ving Tsun. 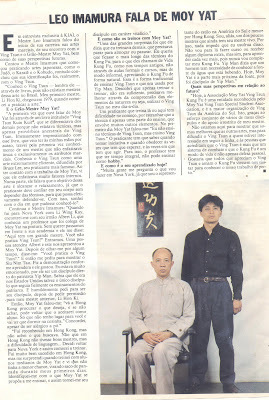 : "I first knew about Ving Tsun trough books 'cause the weren´t many masters of this art in Brazil.My frist Master was Li Hon Ki, who came to Brazil in 1979, when I started to practice Ving Tsun" - said him. KIAI: And about grand-Master Moy Yat? "The first time that I heard about him was through a book called Ving Tsun Kuen Kuit, that was different from others, 'cause that was not about techniques, but just about sayings from the Ving Tsun ancestors. So, very impressed with the book, that was in my hand just by chance,I was in front for the first time the knowledge of a Master that was not just emphasizing the martial aspect of the Art. 'Cause I knew Ving Tsun at the time, as a very efficient art , spread by Bruce Lee, its most famous practitioner. As I have the first contact with Moy Yat's work, I saw that he used to emphasize internal factors. In one side, he used to say that the objective of this art was reach the relaxation, 'cause the practitioner must be confident in his body without know the techniques for a effective self-defense. With this I dreamed about the day that I could meet him in person." So, when I went to NY with Ling Wing Kay , I met his brother Albert Li, who knew a teacher who was a fella of Moy Yat in painting. Without planning, we pass along Moy Yat´s school. And Abert said: 'In this place there is a great Master. Dont you practice Ving Tsun? 'So we stepped in. Someone received Albert, and this person introduced us to Moy Yat. After look me for while he said: Do you practice the Ving Tsun? -so he asked me to do the Siu Nim Tau. I did the SNT as I learned and he liked that. I was very touched 'cause he was a disciple from Ip ManI knew that in US he might be the only disciple who was following strictly the principles of Ip Man. And asked him to become his disciple, after asked my Si Fu Li Hon Ki permission to do that. So, Moy Yat told me: 'Go to Hong Kong search for what you were looking for. If you dont find it, you are able to come back and become my student. But I dont have any place for you here, so you will have to sleep in kitchen' - I agree with that even being allergic to dust. "I was recognized in HK , but did not find what I was looking for. It is not that in HK there ano no good teachers, but de difficulty about language ...So I decided to go back to NY so I started to train. I was very successful in HK but I was surprised 'cause at Moy Yat´s school , standarts students make me realized that I had no chance, becoming a basketball in their hand for the first 5 days. I was very touched by Moy Yat who wanted to teach me, so I became his disciple for life." KIAI: And how is the training with Moy Yat? "One of the greatest surprises was that he said that I used to train too much. He said that I need sometime to walk, have lunch,etc. He wanted me to stay as far as possible from the techniques to something that he called Kung Fu Life.As in old times, no trough formal classes and seminars, but trough some informal way, appreciating the Kung Fu in a natural way. This is the traditional way to teach Ving Tsun and the way that was used by Ip Man. I find out that just train and train, was not sufficient enough, I need to get better trough the comprehension of the nature elements, I mean, to use the Ving Tsun in my daily life. A practitioner who trains there or here has difficulty in his beginning, 'cause he thinks very strange the technique just as a part of the training, wich englobes much more than that. At the first day, Moy Yat told me: " I dont teach Ving Tsun techniques, but I teach Ving Tsun". The practitioner must know when get the initiative and when obey , sometimes he will have to wait, sometimes he will have to act. But for that, the teacher has to have a lot of time for him. The teacher can not teaches as a hobby." KIAI: And how is your lessons today? "A lot of people what I´m gonna do in NY , if I´m already a representant of the style in South America and Master by Hong Kong. I am, one of the few Masters who has his own master still alive. Because of that I enjoy him. I´m not going there to learn in seminars or get some new certificate, but I´m going there to learn more, and more, 'cause my Kung Fu will never be completed. Ip Man used to say that a man has the necessity to learn the origin of the water that he is drinking. Today, Moy Yat is the nearest part of the origin, 'cause he was Ip Man´s disciple." KIAI: What are your plans for the future? "Today, the Moy Yat Ving Tsun Kung Fu Association is a institute recognized by MYVTSSA , and it is the bigger organization of Ving Tsun in South America. That is just possible trough the effort of many disciples of mine and the support of my Master. We are not here to show that we are best than the others. But to spread Ving Tsun for who is interested in follow this line, and for the people who believes that Ving Tsun is more than a fight system, and the Kung Fu is a way of life and not just self-defense. I would like to invite anyone who loves Ving Tsun and Kung Fu to visit us."